The word “BlogNomic” in a Photo can be regarded as being any Hunter’s name, if no earlier Capture Photos of that Target include the word “BlogNomic”. The word “Wildcard” in a Photo is considered to be a valid Word of the Day for any post that Photo appears in - Photos containing the word “Wildcard” may not be used to Capture a Target if the Capturing Hunter has Captured that Target previously. Per Bucky’s input - proxies can generate multipurpose images by using “BlogNomic” and “Wildcard” as Hunter/Day combinations. The first can only be used once per Target (so that players can’t reuse the image), the latter can’t be used by someone who’s already claimed that Target (otherwise they’d just take bonus photos of it when first visiting, and reuse them as needed). 2) Even if I knew I’d be able to post the photo, there wouldn’t be enough time to negotiate with an active player for it. 3) The negotiation would have needed to happen before taking the photo. 1) Idle Hunters should be able to sign photos. 2) There should be a mechanism for handing off a signed photo to another Hunter so that the other Hunter can capture the Target instead. I was also going to suggest a longer than 24 hour grace period for posting photos, but that seems to have been covered already. Whenever the Moderator’s Points are increased, the Points of all other Hunters are increased by the same amount. By having both of the past proposals enact when one was written to replace the other (although I didn’t think to add a repeal-the-other clause), the point generation system is now (a) every week all Celebrant-active players get 2 points, and if the Emperor is active everyone gets 2 extra points and (b) whenever the Emperor gains points through other means, everyone else gets those same points as well. “Every week all Celebrant-active players get 2 points” seems plenty here. RaichuKFM says they’re puzzled as to “why there’s any reason Kevan should be taking photos of things in the first place”, but we’ve let the Emperor play the quieter dynasties before - I don’t think the extra game activity hurts anything, and my score could always be factored into the victory condition as Beat-the-Emperor or something. As a Weekly Communal Action, a Hunter may award 2 points to every Hunter who has been the Celebrant of one or more Targets in the previous 24 hours. An alternative spigot to the previous proposal. Increase the Points of all Hunters besides the Moderator by 2. For a Photo to be “of” a Target, it must be an original photo of the physical object described by the Target, taken by a person present at the location of that object. If any Hunters have claimed points for photos of Targets which would not be considered to be “of” those Targets under this amended rule, deduct those points. A Hunter may not capture the same Target more than once within a 48 hour period. Reproposing the fixes from Elbereth - the word should match the post rather than the photograph (otherwise anyone taking a photo could take a dozen and reuse them whenever they lost control of the target), and photos “of” something shouldn’t include photos of photos, or other trickery. In fact, we should also disallow repeated capturing, otherwise two players who happen to get photos on the same day could keep reposting those photos. This would also stop any easy infinite loops of setting up targets for one another. 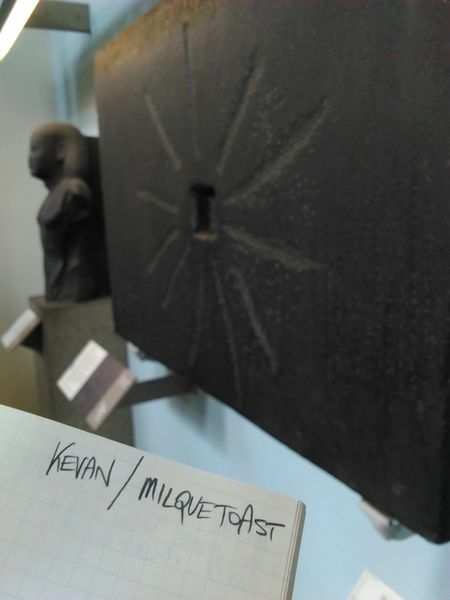 I claim the Shabaka Stone target at the British Museum. Fewer than quorum not voting against. Fails 1-3. Failed by Kevan. A hunter with 100 points or more may achieve victory. Setting up an end goal since points seem to be the way things are being scored. 100 seems like it should take awhile since we are going by ones and twos. A Photo included in a blog post is Confirmed if it contains an authentic handwritten appearance (taken as part of the photograph) of the Merriam Webster Word of the Day for the day on which that post was made, or for the preceding day (per http://www.merriam-webster.com/word-of-the-day), and if it is not copied or visually derived from an earlier Confirmed Photo of the same Target. Replacing the watermark with “can’t copy an earlier photo” - I like the idea of players chalking single, cryptic words in the world. Also, “photo of a Target” arguably includes “photo of a photo of a Target” if you have a postcard or a Google Image search to hand, so let’s (at least attempt to) rule that out now. Fewer than a quorum not voting against. Fails 2-3. Failed by Kevan. Each time an Admin enacts a Proposal, they must increase the Points of the Proposal’s creator by one. the Merriam Webster Word of the Day for the day on which the photograph was taken, or the preceding day (per http://www.merriam-webster.com/word-of-the-day). A Hunter may only include a Photo in blog posts if the Photo contains an authentic handwritten appearance of their name. Preventing Hunters from re-using Photos to claim second-place points if “Capture the Flag” passes. Each Target may be Controlled by a single Hunter (or idle Hunter), tracked in the wiki page and defaulting to nobody. A Hunter may capture a Target by making a blog post that includes a Confirmed Photo of it (embedded as a visible image), unless they are its Celebrant - upon doing so, they become its Controller. Upon becoming the Controller of a Target which had no previous Controller, a Hunter may gain 2 points and award 1 point to the Celebrant (if one exists) of that Target. Upon becoming the Controller of a Target which they have never Controlled before (and which previously had a different Controller), a Hunter may gain 1 point. If a Hunter is not the Celebrant of any uncontrolled Targets, they may add a new Valid Target to the wiki page, with themselves as its Celebrant. Letting second and subsequent places claim lesser points for targets, and allowing freer target creation. The Targets in the game are tracked on the BlogNomic wiki page [[Targets]]. Within the ruleset, a rule only refers to a Target in the sense of its appearance on that page if it is explicitly stated that it refers to a Target in that way. Then replace the “Targets” wiki page with the list of Targets. Closing an arbitrary-text ruleset injection loophole (we really must remember to stop proposing these and voting them through): it’s possible to add a Target described as something like “A sticker with the following sentence written on it. Kevan has won.”, which means that the ruleset would then - quite strongly arguably - legally say that I’d won. As I read it, this isn’t urgent enough to veto Alea Iacta Est, because that proposal also invalidates the Shabaka Stone as a potential Target (because it has no Celebrant), making it impossible to add new Targets in this way. We may as well fix that while I’m here. Also, there’s no such thing as a “struck-through Target” because such entities are “no longer considered to be Targets”. If the proposal “Alea Iacta Est” or the proposal “What Do Points Mean?” failed, this proposal has no effect. A Hunter may bet that another specific Hunter will be the one to photograph a given Target; this is called backing a Hunter. To do so, they must pay two Points and make a new blog post titled “I bet X gets Y,” where X is the name of a Hunter besides themselves (the backed Hunter) and Y is the name of a Valid Target. If the backed Hunter does post a Confirmed Photo of that Target while it is still Valid, the Hunter who backed them gains three Points, after which the backing relationship ceases to exist. A Hunter may not back more than one other Hunter for a given Target. If Proposal: Alea Iacta Est failed, this proposal does nothing. In the rule “Targets”, replace “They may then add a new Target to the list” with “They may then add a new Valid Target to the list”. Patching the proposal so that it forces the new Targets to be Valid. If Proposal: Make It Snappy failed, this proposal does nothing. They may then add a new Target to the list, with themselves as the Celebrant of that Target. In the same rule, after the phrase “If a Hunter makes a blog post that includes a Confirmed Photo of a Target”, add “that they are not listed as the Celebrant of”. They may then gain 2 points and award 1 point to the Celebrant of that Target. The Celebrant is the name of the Hunter who added it to the list. Proposal: What Do Points Mean? Each Hunter has a number of Points, tracked in the GNDT. Hunters may take Photos, hosting them on whatever website or social media service they wish. A Photo is Confirmed if it contains an authentic handwritten appearance (taken as part of the photograph) of the Merriam Webster Word of the Day for the day on which the photograph was taken, or the preceding day (per http://www.merriam-webster.com/word-of-the-day). The Shabaka Stone at the British Museum, London. If a Hunter makes a blog post that includes a Confirmed Photo of a Target (embedded as a visible image), they may strike that Target through by editing this rule. Struck-through Targets are no longer considered to be Targets. Trying something a bit different this dynasty, so no in-character preamble: this is intended as a real-world scavenger hunt where players take photos of things and submit them to the blog. We’ll see what direction the proposals head in, but I’d be interested in restricting the game to a particular city, to give the potential for some real-life interaction between players (such as having short time windows in which photos had to be taken without being spotted). It’d limit the player base, but it might bring in some much-needed fresh blood, and distant players could potentially recruit local friends to run missions on their behalf. Replace “Imagineer” with “Hunter” and “Boss” with “Moderator”. Timed out / quorumed 3 votes to 0. A new dynasty begins. I am massively over-budget with 30,000 after nobody undercut my scandalously high bid on the Haunted House. I pay off my -80 Debt. (“An Imagineer may reduce their Budget by X to reduce their Debt by X (ie. move its value towards zero), at any time.”) I now have a Budget of 29,920. The rest of that Business Day: +90 Tourism (stays zero), +180 Ticket Income (also stays zero), +9 SMILEs. With 35 SMILEs to other Imagineers’ 18, 10 and 10, I declare Victory. The first shuttle buses are showing up Monday at 7. Maybe… maybe we can say there’s a construction-based seasonal theme? A new Business Day has begun. Set the Boss’s Debt to -10000. Dialling the endgame timer down to somewhere more dramatic - it’s currently at -99680, and has only decreased by 320 since the start of the dynasty. IceFromHell and Spitemaster idle out after 9 and 8 days of inactivity respectively. The Thing Zone remains standing and quorum drops to 3. Effect: +2 SMILES per Teen or Adult Visitor that Business Day. Teen and Adult Visitors are ignored for the purposes of all non-Log-Flume Buildings in a Zone which has a Log Flume. Hello? Did someone cut my intercom? Is anyone hearing this? I didn’t just invent you all… did I? If a Demand Post is more than a week old and has no bids, any Imagineer may close it by making a comment on it to that effect, in which case Budgets are not adjusted and the relevant Building does not become planned. Upon posting a Demand Post, the Boss must add three Visitors (of random types) to each Business Day which is not Crowded. Effect: +1 SMILE and 25 Wages per visitor that Business Day. When constructing a Building, an Imagineer may choose to instead construct a Budget version of it by treating either C, S or X as zero in the costing equation. Budget Buildings are noted as such in the Nomicland wiki. All numbers in the Effects of Budget Buildings are considered to be halved, rounded down, and any instances of the word “half” are replaced with “quarter” in those Effects. If any Imagineer has an LBD greater than 0, move their Debt toward 0 by 1000. Effect: If this Imagineer is the first to exercise an IP License for a given Business Day, they may, upon exercising it, immediately move their Debt toward 0 by 2000. If they do so, they must also immediately move the Boss’s Debt toward 0 by 2000. Effect: If this Imagineer is the first Imagineer to process a given Business Day, +2 SMILE and +2000 Tourism. What? Well WHY won’t any of the staff go in there? WHO died? I don’t have time for this. Someone stick a Victorian facade on the front and get out of my office! If a bid exceeds one-third of the Boss’s Budget it is ignored. Hmm, by my reading of the ruleset, IceFromHell’s “Guess the Theme Zone” doesn’t exist, as it has too many words in its name - the only way to create a Zone is to create “The X Zone”, where X is “any word” from the dynastic titles. If a Business Day has more Visitors queued than twice the number of Imagineers, then the Day is Crowded; otherwise it is Uncrowded. Upon posting a Demand Post, the Boss may add three Visitors (of random types) to the most recent Business Day, if that Day is not Crowded. Throwing out the vagueness of the “current Business Day” - IP Licensing can target any day (in practice it’ll be the one you’re about to process next), Focus Grouping the most recent one. Condensing “total Visitors for that Business Day greater than twice the current number of Imagineers” into an adjective. Upon posting a Demand Post, the Boss may add three Visitors (of random types) to the current Business Day, if doing so would not make the total Visitors for that Business Day greater than twice the current number of Imagineers. NOW the government is telling me that the water in the lagoon has to “circulate” or it will “just go back to being a swamp.” I guess at least we can drop some inner tubes in the channel to the pumping station. Who wants a canal instead of a street? Passes/times out 4-0. Enacted by Brendan. If constructing a Building would cause the total Size of all Buildings in that Zone to be greater than four times that of the next-highest-total-size Zone, and would cause the total Size of all Buildings in that Zone to be greater than 12, that Building may not be constructed. GenericPerson hasn’t posted or commented in 9 days and idles out automatically. Quorum remains 4. If an Imagineer has any Planned Buildings in their Zone, then they may not post bids on Demand Posts. For each post which was previously a Demand Post, and which was closed while it had a bid which was being ignored under the previous wording of the sentence replaced above, undo the effects of its closure: that post then becomes a Demand Post again. Reproposal of the previous, with a gentler and less bugged fix (I was calling them “Planning Posts”, but they aren’t even Demand Posts when they’re closed; and the “gain debt of the difference” clause is potentially abusable by posting an ignored bid of zero to wipe out someone else’s gains). For each Planning post which was closed while it had a bid which was being ignored under the previous wording of this sentence, increase the Debt of that post’s Winner (ie. move its value away from zero) by X, where X is the difference between the winning bid and the lowest ignored bid. “Ignoring” winning bids is currently a problem: if Mickey bids a ludicrously high 50,000 on something and Donald bids 1,000, but Donald then wins a different bid, Mickey’s old bid suddenly becomes valid (and probably due to be closed) again. Oh, hey, this blueprint was stuck between two file drawers. Blue plastic “ocean”... cargo netting… plank… seems reasonable! Who submitted these again? Timed out / quorumed 4 votes to 0. Enacted by Kevan. If the Boss’s Debt is 0, the Imagineer with the most Smiles has achieved victory. All right, we drained the swamp, but now the EPA says we have to put the stuff we drained… somewhere else. Who’s got two square miles left? Times out 2 votes to 1. Enacted by Kevan. If the list of steps to process a Business Day is a bulleted list, make it a numbered list instead, retaining its current order. Reconciliation: if the processing Imagineer’s Budget is greater than 0, move the Boss’s Debt toward 0 by that amount, then set the processing Imagineer’s Budget to 0. If an Imagineer would move their Debt toward 0 by a value greater than the current absolute value of their Debt, instead, their Debt is set to 0 and their Budget is increased by the amount which the movement exceeded that absolute value. Keeping the change if you overpay a Debt. Tourism: Move the Boss’s Debt toward 0 by (10 times the number of Visitors for that Business Day), plus any Tourism generated in the Imagineer’s Zone that Business Day. Ticket Income: Move the processing Imagineer’s Debt toward 0 by (20 times the number of Visitors for that Business Day), plus any Income generated in the Imagineer’s Zone that Business Day. Miscellaneous: Apply any Building Effects of Buildings in the Imagineer’s Zone which have not already been applied during these steps. If the Effect of a Building “requires” certain Visitors, then its effect only occurs if the Business Day being processed includes that set of Visitors. Playpit: +1 SMILE per Child visitor that Business Day. Concession Stand: +100 Income and +50 Tourism (requires one Child or Teen and one Adult). Indoor Coaster: +1 SMILE per Teen or Adult Visitor that Business Day. Guest Assistance Station: +1 SMILE (requires one Child and one Senior). Lazy River: +X SMILE, where X is the half number of Senior Visitors that Business Day (rounded down). Lagoon: +4 SMILE and +100 Income (requires one Child, one Teen, one Adult and one Senior). Monorail: +4 SMILE and +100 Income, unless the Imagineer exercised an IP licences on the Business Day they are processing. Gift Shop: +200 Income and +100 Tourism (requires one Child, one Teen, one Adult and one Senior). Okay, so… so all the people who came through on our first preview tour were kids. That’s fine! That’s okay. Maybe this time, though, just see if you know anyone who’s less likely to hijack the forklifts? Proposal: What makes a different day? Reaches quorum and passes, 4-0. Enacted by Brendan. Effect: As part of the Local Accounting step, the processing Imagineer may gain X/2 Smiles (rounded down), where X is the number of Senior Visitors that Business Day. Effect: As part of the Local Accounting step, the processing Imagineer may gain 4 Smiles and move their Debt toward 0 by 100 if there was at least one Child, at least one Teen, at least one Adult and at least one Senior Visitor that Business Day. Effect: As part of the Local Accounting step, the processing Imagineer may gain 4 Smiles and move their Debt toward 0 by 100 if they did not exercise any IP Licenses during the Business Day they are processing. Effect: As part of the Global Accounting step, the processing Imagineer may move the Boss’s Debt toward 0 by 100 there was at least one Child, at least one Teen, at least one Adult and at least one Senior Visitor that Business Day. If they do so, during the Local Accounting step, they may move their own Debt toward 0 by 200. All right, I’ve reviewed these blueprints, and frankly I don’t know if it’s possible or safe—but if it’s going to be ready for opening day, we’ve got to start digging the foundation NOW. Who’s still got room for this monster? Just as a warning, whoever builds it is going to be the first to test it out! I’m going idle after a week of inactivity. Quorum drops to 4. An alternative or addition to “Make Bidding Love, not Bidding War” - having to outbid somebody by 25 instead of 1 makes it a tougher decision. Reaches quorum and passes, 5-0. Enacted by Brendan. Reaches quorum and passes, 5-1. Enacted by Brendan. If an Imagineer has already made a bid on a Demand Post, any additional bid that Imagineer makes on the same Demand Post must be at least 100 less than any other bid they already made on that Demand Post. Stops bidding cycles from dragging down too much. Also adds a bit more strategy to the bidding process. Hey everybody! I unidle. Quorum is 4. If you have friends and family who will agree to sign an NDA, we’re going to allow a limited number of tours of the grounds as construction begins. The first Business Day has begun. Ticket sales aren’t going to be enough, people! We have to harness synergy and exploit our brands in ice cream form. Character-head bars, sweepstakes on the wrappers, and exorbitant prices to pay for our eco-green refrigeration equipment. Who can make this happen? Effect: As part of the Local Accounting step, the processing Imagineer gains 1 SMILE per Teen or Adult Visitor that Business Day. Effect: When this Imagineer would pay to create a new Building in a Zone they operate with a Tunnel System in it, when calculating the currency they must spend to do so, they may first divide the total Size of all other Buildings in the Zone by 2. Effect: During the Local Accounting step, if there was at least one Child Visitor and one Senior Visitor that Business Day, the processing Imagineer gains 1 Smile. Re-proposing “Sleight of Land,” except this time actually modifying the rule “Construction” instead of the rule “Buildings,” which does not exist. Sigh.